In 2018, the Goethe-Institut Nigeria in the context of its partnership with the Center for Art and Urbanistics (ZK/U) in Berlin, the cultural office of local government Berlin Mitte, SAVVY Contemporary Art Space Berlin and the Arthouse Foundation in Lagos, continues with a residency programme for artists and curators from Berlin and Lagos. The Artist’s and Curator’s Residency Berlin-Lagos has been initiated to strengthen the dialogue between Germany and Nigeria. It provides an individualized offer in order to get an insight into the art and culture scene of the respective city and the partner institutions. They will offer possibilities of exchange, mentoring, making contacts and the presentation of work results. Thanks to our new partner Arthouse Foundation, the residency programme can be set up bilaterally. For the first time, we can offer two artists/ curators, living and working in Berlin, the opportunity to come to Lagos for a six-week stay each in the Nigerian capital. 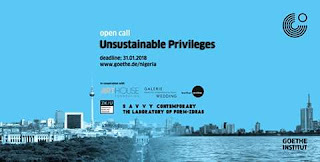 At about the same time, one Nigerian artist/ curator will start a three-month residence in Berlin.